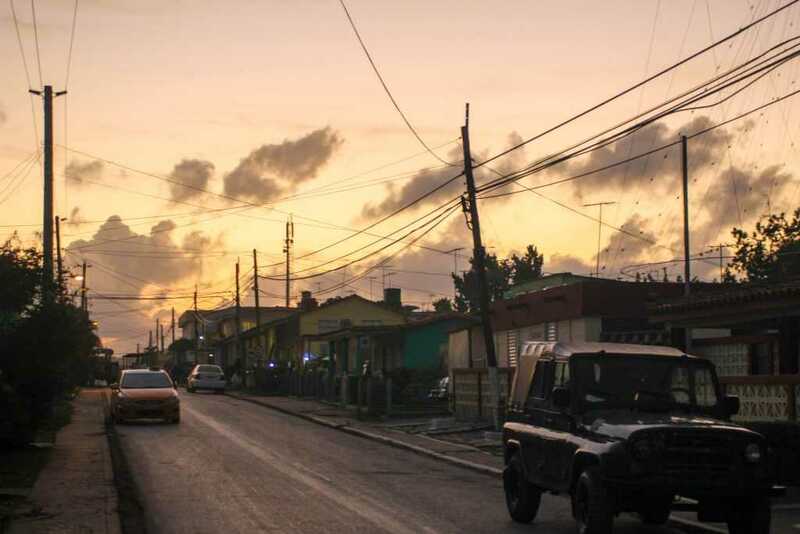 It was Christmas Eve and I woke up early again, so I decided to take another walk before breakfast, to say goodbye to Trinidad, the town that stole my heart. The kid from across the street was preparing the bread for the fish sandwiches his father was going to sell later, and when he seen me, he smiled and said “ola”. On the other side of the road, a cat was hiding underneath a car. I continued my walk until I met another sandwich maker, and I decided that I will buy my lunch from him. What’s better than a freshly made pork and cucumber sandwich, to replace the tasteless ham and cheese ones from the motorway gas stations? So I bought two, for only 20 pesos (CUP). The road from Trinidad to Vinales took almost all day, as we had to go back to Havana and from there head to the North of the island. We stopped twice on the way and I got the chance to take some nice pictures of the local children. 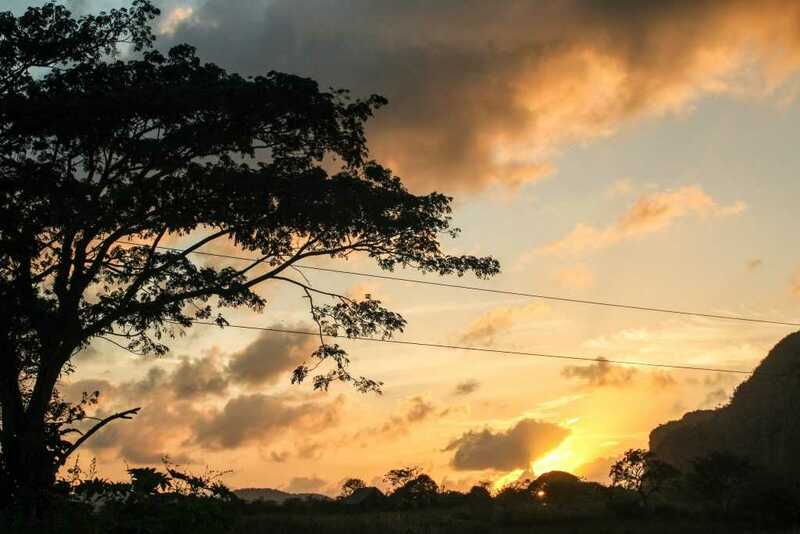 By the time we reached Vinales, the sun was almost setting. As always, the group of locals, the owners of the casas where we were staying at, was waiting for our bus. 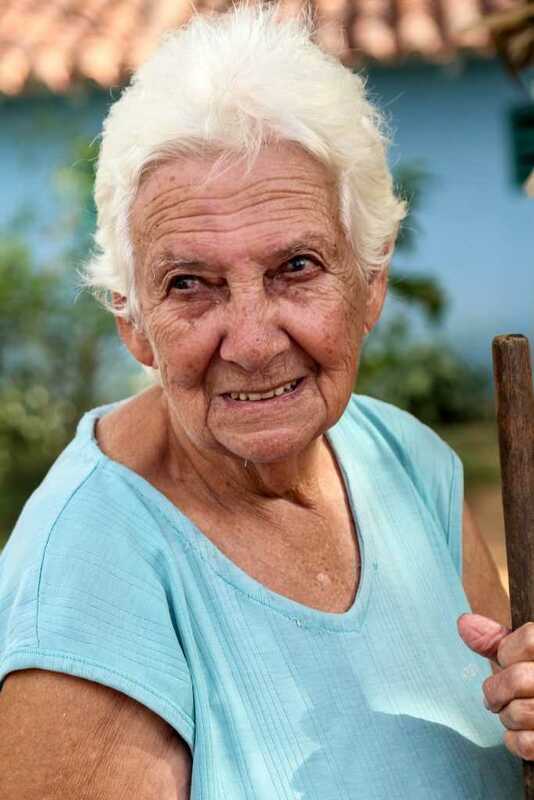 I got the last casa of a muddy street and left with a smiley older woman that led me to my room, in the back of the yard. The casa was small but beautiful, with a nice porch and a roof with a rocking chair on it. In Cuba most of the roofs are not pointy and covered with tiles, but flat, so that they can be used for different things, like drying clothes for example. 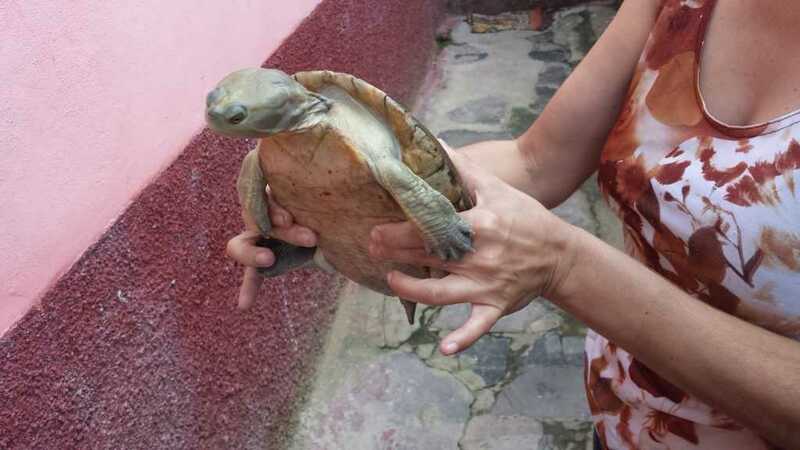 The lady showed me around and also introduced me to Cuca, their pet turtle. As it was Christmas Eve, our guide had a lovely surprise for us and, for the first time in our trip, we were going to eat at a Cuban family’s house. Their house was lovely, nicely decorated, with a beautiful garden where they even had a small pool. They welcomed us with open arms and home made cocktails (with extra shots of Rum in them). It was a great evening, with a lot of delicious food, even wine and cake! We had a lot of activities planned for the following day and, for once, I managed to sleep the whole night without waking up at 5am. After a delicious breakfast, our group met at the local gas station and boarded our bus. Because it was Christmas, everybody started to sing and Bethan even decorated the bus with cute ornaments that her mother made especially for this occasion. 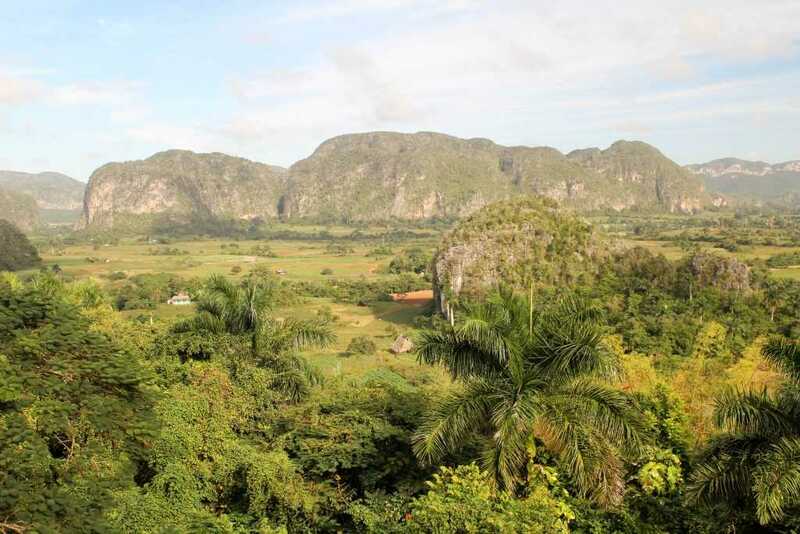 Our first stop of the day was the Mirador, from where we could see the whole valley of Vinales, another Unesco protected area of Cuba. The scenery is very dramatic, with plains where the tobacco is grown, broken up by mogotes – steep hills composed of limestone. We drove next to one of the mogotes, to visit the cave inside it. 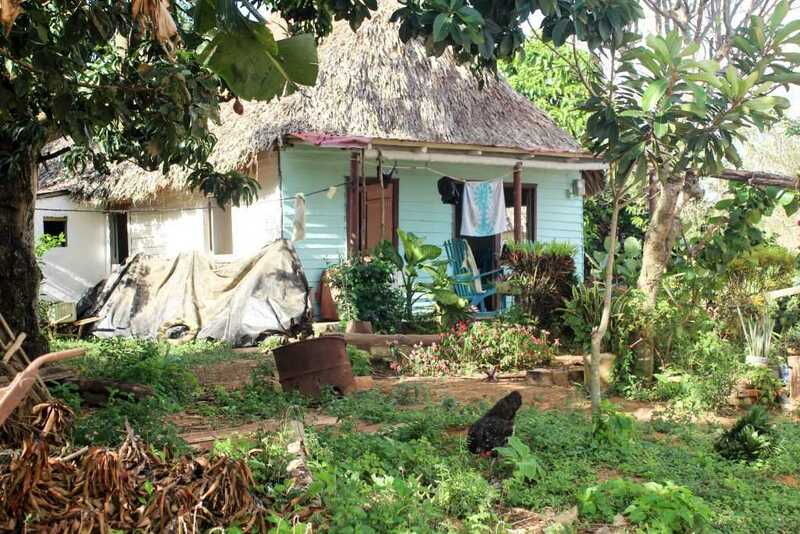 At the entrance, a couple of young Cubans took us even further in the past, when the island was inhabited by Taino, the indigenous people of the Caribbeans. They were both dressed in traditional clothes and were singing at the drums and the flute. 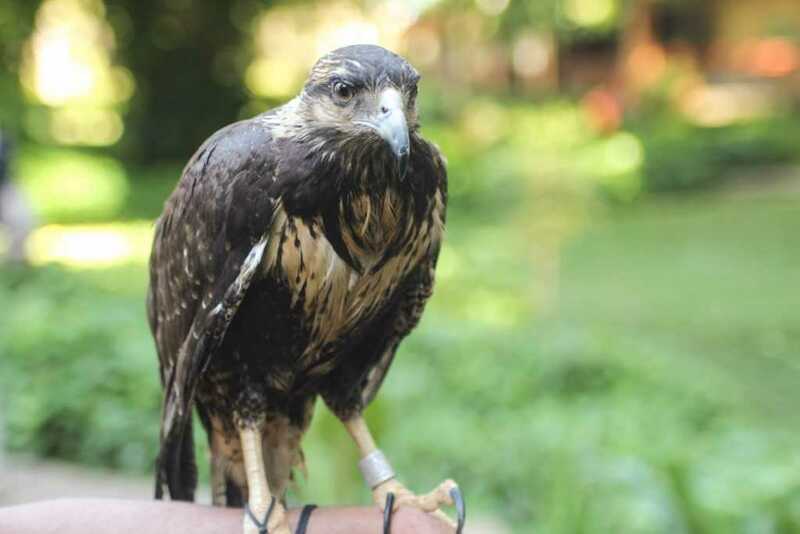 The man even had a baby hawk on his arm. After we drank a refreshing sugar cane juice freshly squeezed in front of us, we entered the cave. It was narrow and wet, and not very well lid. We walked for about 10 minutes, until we reached the water, and from there we continued out way out on the boat. The guide didn’t interact with us too much, he just told us about the different rocks from the ceiling and what they looked like. It was interesting but not that impressive. Our next stop was the prehistoric wall, which is a painting that depicts the evolution theory. 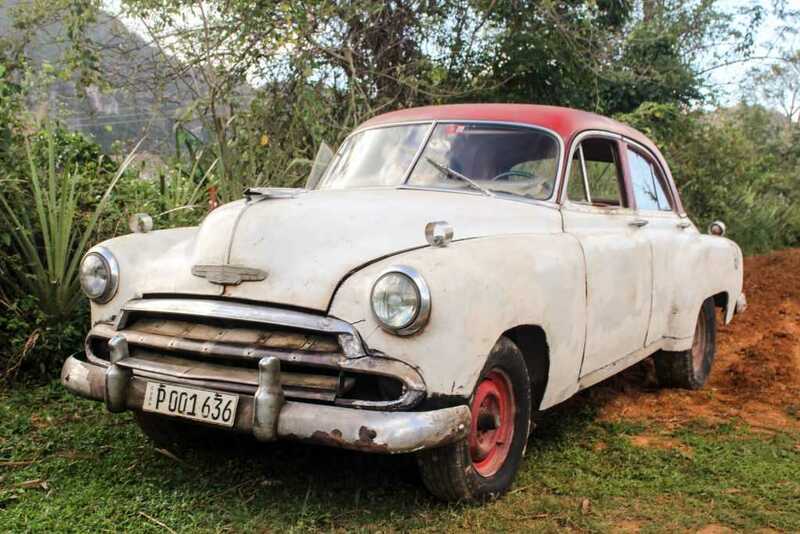 Despite the name, it was designed in the early ’60 by Leovigildo González Morillo, the former Director of Mapping at the Cuban Academy of Sciences. It is 120 meters long and it took 18 people 4 years to complete. It has to be repainted every year because the paint fades due to the weather. I honestly didn’t find it to be very interesting and I was happy that we didn’t spend a lot of time there. 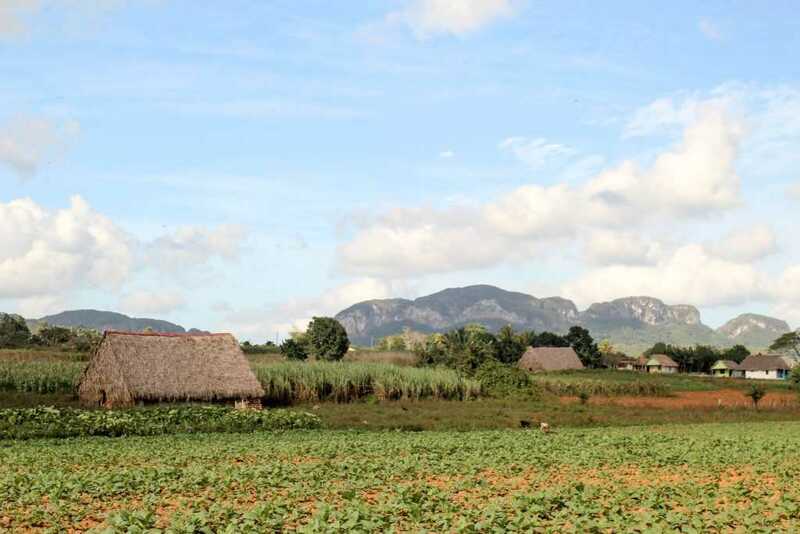 I was very anxious for our next stop in the Valley of Vinales, which was a tobacco farm. 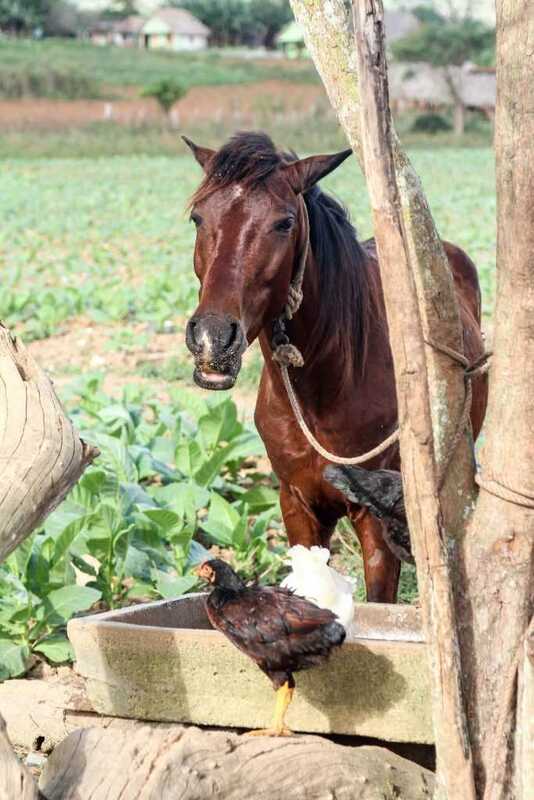 It is said that the best quality of tobacco is found in this area and that the cigars made here in local farms are the same quality as the famous Cohiba, for example. The farm was nothing what I have imagined it to be. We stopped on a field surrounded with plants, at the end of which there was a small wooden hut. I am sad to disappoint you, but cigars are not rolled on the thighs of virgins. 🙂 This was a saying that the Cuban cigar makers invented to encourage men to smoke more cigars, back in the 19th century. The tobacco leaves are harvested from the bottom up, usually leaving a week apart between each level. 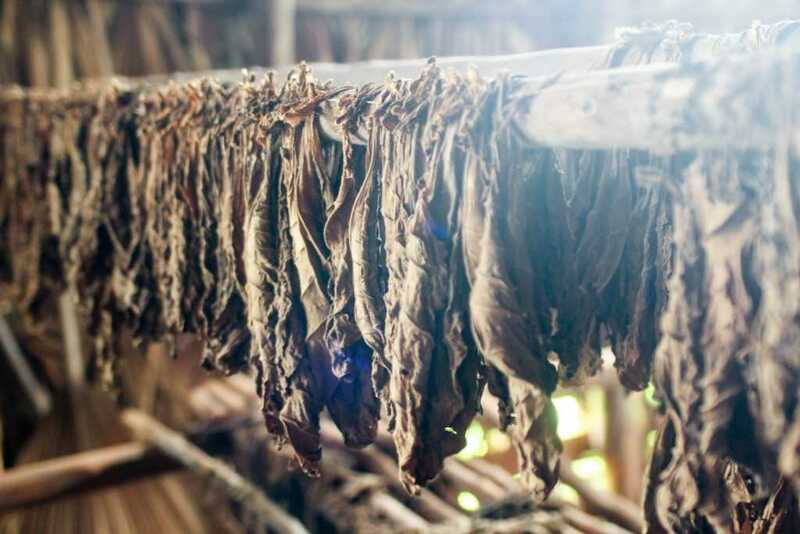 Then, the tobacco is taken into the wooden barns and dried. Once the leaves have aged properly, they are being sorted and piled up depending on quality, and then the cigars are made. In these small farms, everything is done by hand. I found out all this information from a man who actually made a cigar in front of us while he was explaining. Then he gave us one already dried (once they are rolled they need to go into a special box to be pressed and hold into the round shape of a cigar) to try it out. I am not a smoker and I have never tried a cigar before, but I quite enjoyed the flavor, even if it made me cough a few times. I bought 20 cigars from the farm for only 10 CUC, to give out as gifts back home. In the afternoon we went for a hike in the valley to discover the local life of Vinales. I enjoyed the quiet, relaxed and slow pace of the area, not invaded by other tourists. 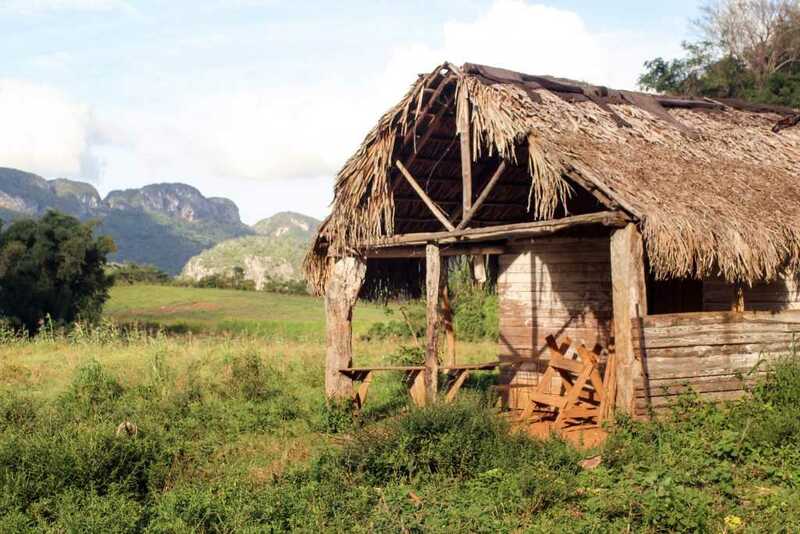 Even if the town of Vinales is very touristy, in the areas surrounding it you barely meet another foreigner. I loved this about Cuba, the fact that there is still that feeling of peace before the storm (aka tourists). Tonight’s dinner was another surprise. 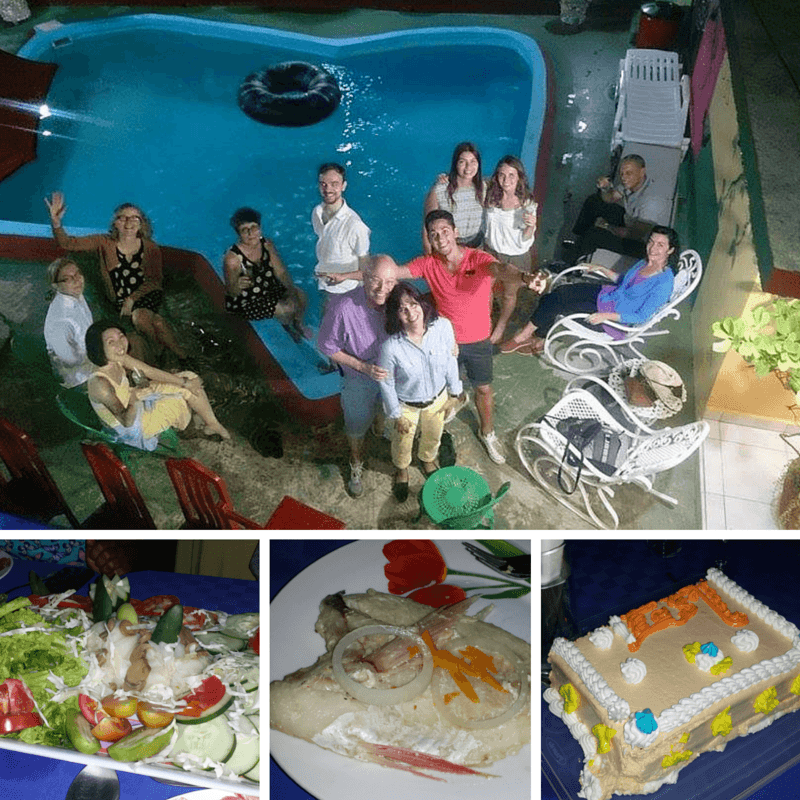 Each of us was staying at a different casa, and each of the owners spent the whole day cooking for us, making us feel special for Christmas. All of us gathered to one of the houses and each of us had a different dinner. 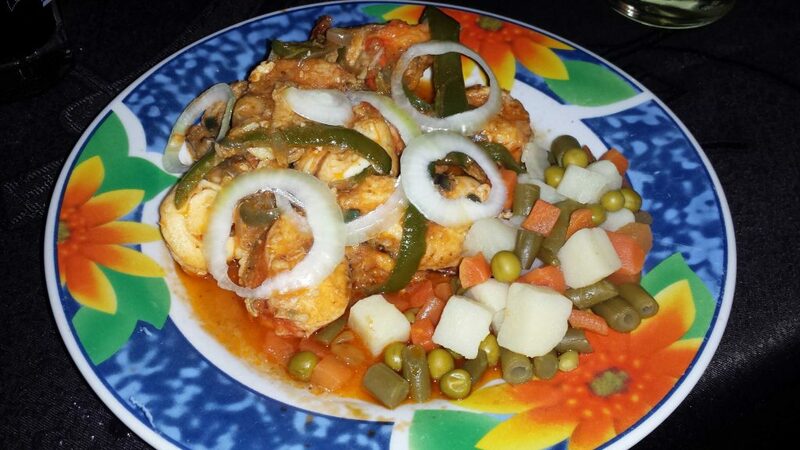 I had lobster and I was very happy because I never tried it before and I was actually planning on having it in Cuba, as here it’s cheap, not like in the UK. That was so nice of the Cuban family to let you guys eat with them! The paintings on the rocks look amazing. Once again Joanna, your words so beautifully captured Vinales…..thank you for taking the time to record our incredible journey! What an incredible adventure through Cuba. The mogotes are so pretty! There’s nothing like that here! Sugar cane juice is delicious but I have never tried it freshly pressed and Cuccu is so cute! I love that you got to meet the natives as well! Wow, that sounds like an amazing adventure! I would love to go to Cuba someday! Wow, what an amazing adventure and so beautifully written and such stunning photographs. 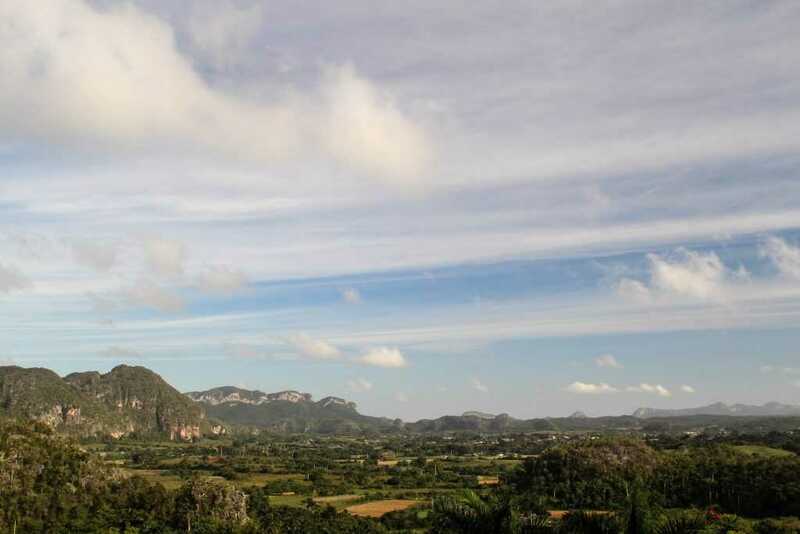 The valley of Vinales looks beautiful. and I’ve always wanted to try sugar cane juice! It truly does sound like you had an amazing time! 🙂 Lovely post. 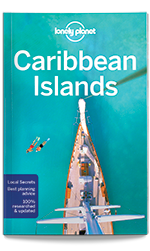 When we travel, we usually just do the usual – which means stay in the resort and “explore” the island via pro tour. This is not that. It is wonderful how you get to really get to know the locals and experience the culture. And love your photos! I love to eat with the locals when I’m traveling. I have tried freshly pressed sugarcane juice. It’s delicious! wow, what a fun adventure! I like this kind of trip. Getting to know the local and their produce. Thanks for sharing! Awesome photos by the way. That’s such a beautiful place! It’s a nice escape from the city. It’s also a great place to enjoy good company and to just relax with the family. That is such a dynamic painted wall. Omg how great was your Cuba trip?!?! Cuba is on my bucket list. I want to visit so bad! Great to spend Christmas like that in Cuba. Must be really special! The picture with a turtle is too cute! Thanks for letting us to explore the Cuba. It looks like an amazing adventure! You’re writing so beautiful the articles! I still working on my English! 😛 Thanks for this update! Happy Tuesday! What absolutely beautiful photo’s. Cuba is deffo in my bucket list. Looks like you had an amazing journey. Thanks for sharing. Looks like the place is a great place to stay away from busy people, busy street and busy life. Nice photos you have! Looks like the time it took to reach Vinales is worth it. It must be something to be met by people who seem so happy. The smiles on their faces, even the little one too. That painting (coloring) on the mountain stopped me too for a moment. It was weird and beautiful. 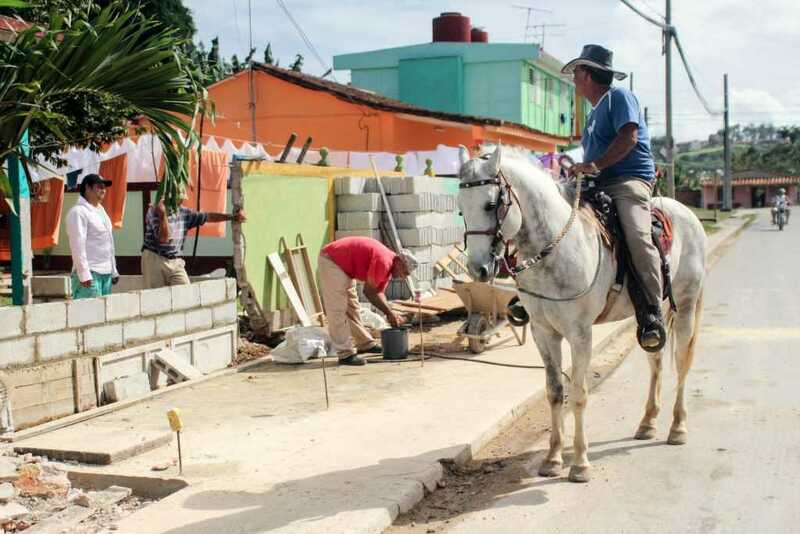 You know what’s nice, you are seeing Cuba differently from typical tourists! I try to stay away from being a tourist. When I travel I like to get involved in the local life and see the culture of the place directly from the locals. I am not happy if I don’t get to know local people and spend some time with them, learning from them. 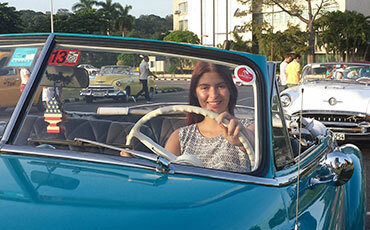 Indeed, people in Cuba are smiling and are happy to meet foreigners. It’s a feeling that you rarely get when you travel in any other country. It takes guts too. Not a lot of people are willing to do so, especially in a foreign and unfamiliar country and culture. You take me on your journey through your writing! What a unique Christmas to have! I loved the part beyond the city and seeing real life there through your pictures! Wow. This sounds like a brilliant trip. I love staying with the local people to get a real feel for a country. When I visited Australia I was lucky enough to stay with the Aborigines for a while. It was fascinating. I have never been to a tobacco farm though I would love to one day. And you said everything is done by hand thats so authentic. You have captured the local life of town of Vinale very beautifully specially ones after sunset. It seems like a place that has been trapped in time, the old cars for example. The paintings on the rocks look incredible. I have never had Cuban food. What an amazing adventure. Loved that you interacted with so many locals. Your pictures are just breath taking. All the children and people look so happy! I think even Cuca the turtle is smiling! One of the beauties of traveling is getting to interact with the locals. It was really hospitable of them to let you eat with them and share their culture. The Prehistoric Wall looks so cool. Now THIS is a true true travel post if I’ve ever seen one! Holy spatula I loved how detailed you were about everything matching picture to word, creating vivid imagery. I would honestly love to visit this place and experience the immense wonder that you describe and illustrate here. What an experience! I have been to Cuba once but stayed on the resort for most of my vacation. This is so interesting. I want to know more about cuban family. What a way to spend Christmas! I love hearing about your adventures and where and what you eat for dinner. It is so amazing to see the way other people celebrate and live. How loved you must have felt that these people spent so much time making a meal for you! What a fun experience! I have been to a tobacco farm in Kentucky but would love to go to one in Cuba. Im sure my husband would too since he loves Cuban cigars. Once again your pictures are stunning. Cubans are real pretty. They have such nice eyes and pointed nose. Their place as well is charming making me want to visit it as well. Perhaps in the near future when my boys could all travel and appreciate the environment, the people and the food. You’ve sold me on Cuba as a place to experience culture/a different lifestyle. Really great writing to give an honest impression of a place that’s so romanticized. I’ve learned so much about Cuba from your posts! I didn’t realize that cucumber was used in Cuban food. I also didn’t realize that there were UNESCO protected areas in Cuba. 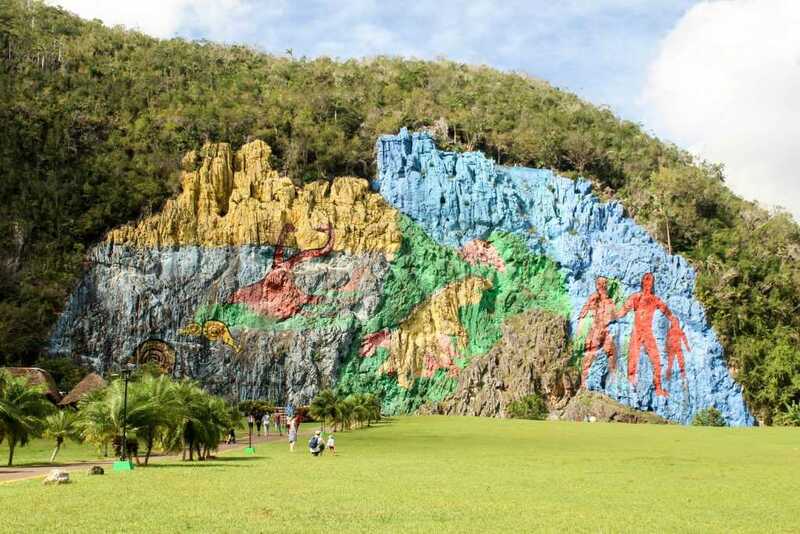 The scenery in Vinales is just stunning. And I love that pet turtle! So cute! I was just planning on taking a trip to Cuba. It seems like an amazing place…. Whoah. It looks like Philippines. The set up of the place is one of the set ups we have here particularly in the province. It’s just that there are still differences, though. I bet that you had enjoyed your stay despite of some cons you encounter. Great post! Funny though that I found that painted cliff interesting! Perhaps because it’s something completely different and doesn’t really fit to the scenery. Never been to Cuba – one day hopefully will have a chance. Anyway it’s interesting to read about different place and learn new things. What beautiful place. the scenery is breathtaking. This place is lovely and the pictures are awesome. I need to add it to my “Places I need to visit before I die” list. It is truly amazing what you see and learn when you visit another country. Looks like you had a great time. I love that you got to experience so much authenticity on your trip! I am reading your post in iPhone and thoroughly enjoying it. I liked the beautiful girl, she seemed Indian to me. What a wonderful experience. I love that you were able to enjoy things out of the ordinary and really get the feel for the land. Your pictures are beautiful and tell a story all their own. I adore the photographs of this post and how thorough your writing is! Oh wow what a fantastic experience and great adventure. Such brilliant photos. What an awesome experience! I love seeing all of your pictures! I am so glad that your host treated you well and indulged in the holiday! Incredible. You paint a very vivid picture. I love that saying to promote cigar smoking – that’s hilarious! That looks like an amazing adventure! 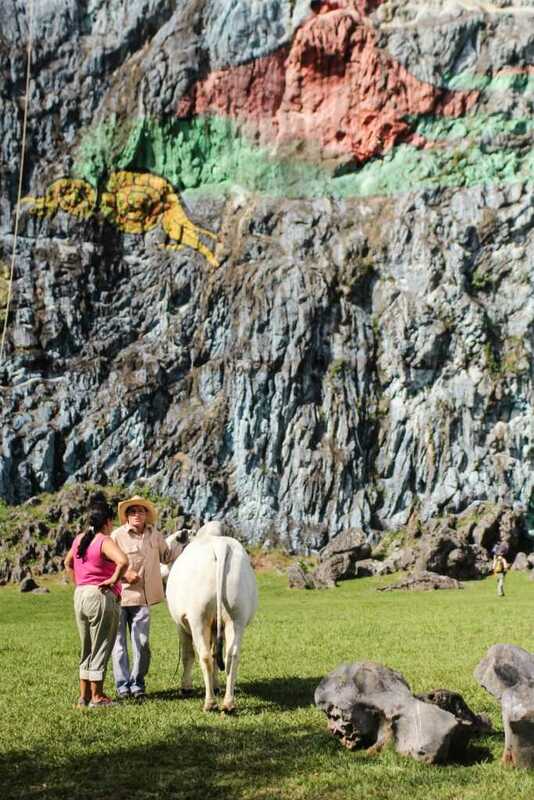 I love the prehistoric wall, so colorful and full of history, in the middle of nature. It must be so great to meet and talk with local people and get a peek into different cultures. That is so interesting about the roofs. I love the scenery. Experiences like this makes me believe that there are still many good people around the world. Cuba seems to be an exotic place to be at and the history of the place has a fair share of conflicts, and yet you get to experience something like this. It looks like our province here in the Philippines. It looks like a quiet and peaceful place to go away from busy roads. The people live a simple life. I miss visiting a place like this. Vinales looks nice but I hope there is an internet connection there. I would love to go and still stay connected. Wow, what a great adventure! It looks beautiful there! Very beautiful town that looks vintagey. The people’s smiles looks relaxed. It’s far from the stresses of the city. Feels like I can breathe there. Such beautiful photos! I love the paintings on the mountains, that would be amazing to see! What a beautiful place to visit. I love how they painted those rocks. 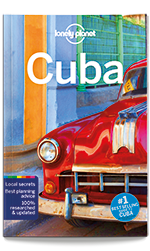 Cuba is on my top destinations. Your pictures are breathtaking, Cuba it’s such a fascinating country in spite of all the damage Castro has done to its people. 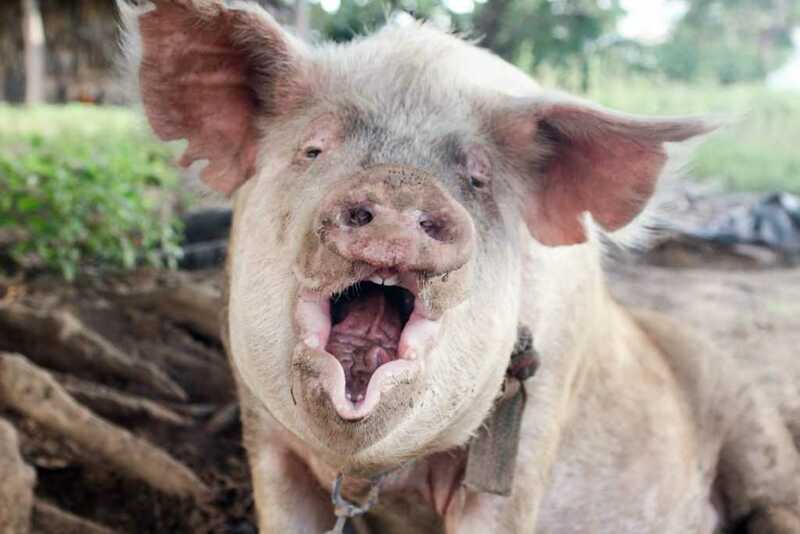 Your trip sounds amazing, Having lunch with a cuban family, spending christmas in a beautiful place and being able to eat native food must have been very enjoyable. 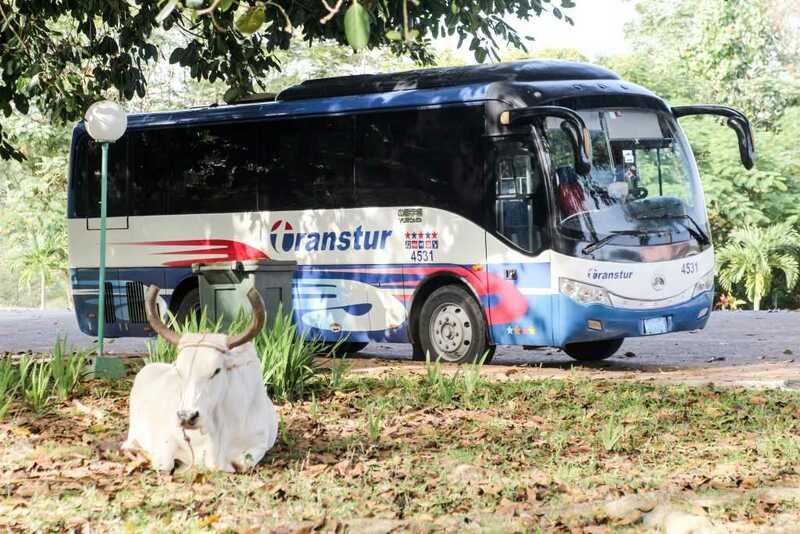 The experience you get of a country is best when you get to mingle with the locals.No tour guide could show you more . As previously said your photos are beautiful and have captured the trip wonderfully on camera. A wonderful write up of what sounds like an amazing place and experience. Your pictures certainly tell a story all on their own! Really great photos. Sounds like it was an amazing adventure for life long memories. Those photos are all so beautiful. It sounds like you had an awesome trip. I would really love to go there sometime. That prehistoric wall is really neat. I would love to see that someday. The place looks so wonderful! I would love to go there, such a peaceful ambience! This was a really interesting read about your trip. I love how detailed (and honest) you were, as well as how great your photographs were. What a truly memorable experience to be in Cuba. I absolutely loved your beautiful photos! Oh my goodness! These are beautiful pictures! The food and views look incredible! This really makes me want to travel to Cuba! I so love how you narrate this post by covering all great points: from smiles, food, up to nature. They all went in one fantastic guide for Vinales. These photos are beautiful. I have always wanted to visit Cuba. Sounds like you had an adventure. Looks like you found a little piece of paradise. Thank you for sharing it with us. What a beautiful adventure and memories you had while traveling. I LOVED your photos especially with person. It is crystal clear. I love traveling and learning different cultures and traditions. I for one come from the Philippines and learning American ways is quite fun and sometimes scary. 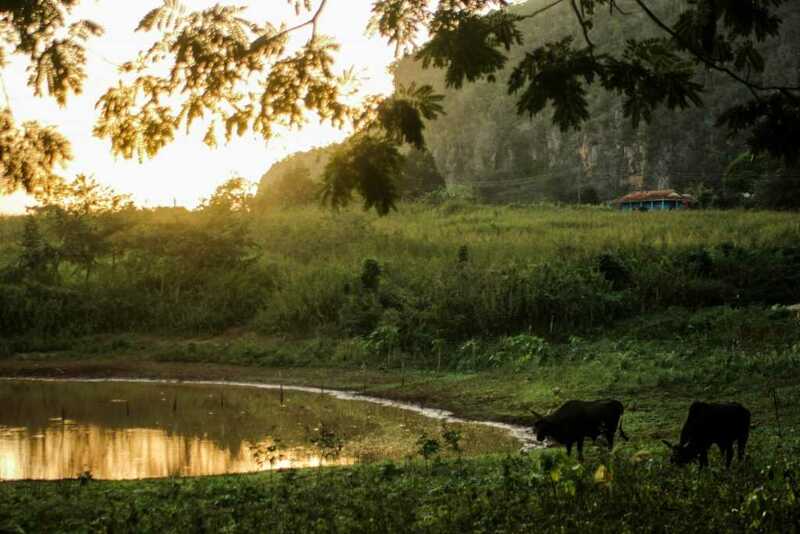 Vinales comes to life so beautifully through your words and the pictures you have captured so lovingly. I liked the shots of the people and the expressions that you have captured. 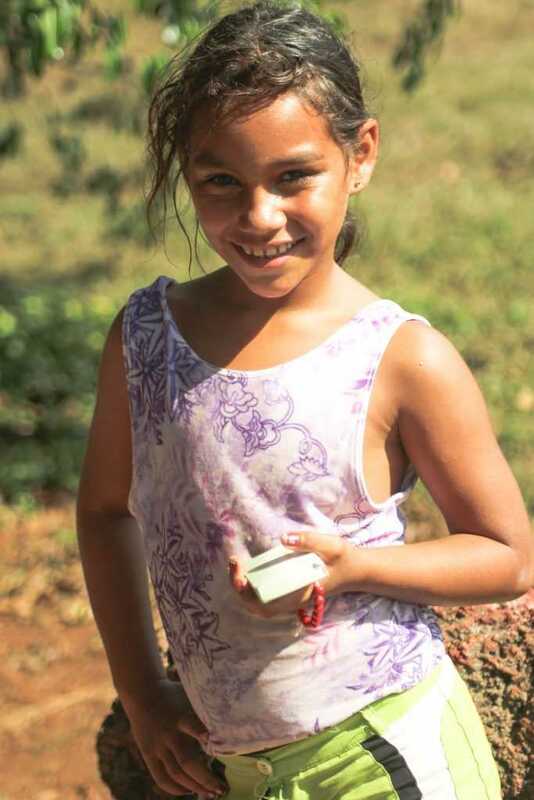 Aside from the stunning natural beauty of Vinales I absolutely love all the smiles. I definitely need to visit Cuba! I found the prehistoric wall really interesting, it’s a really nice attempt to depict what could have happened long ago. Beautiful photos, we would love to make it to Cuba. 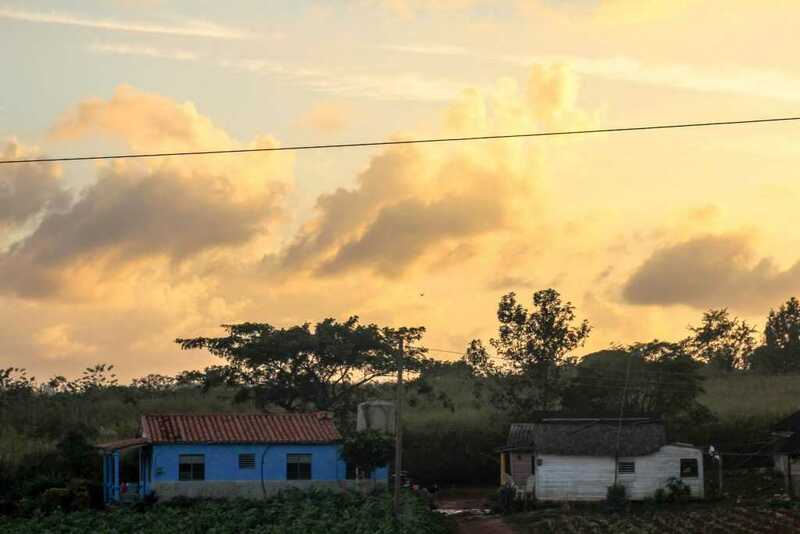 Staying in the homes of locals makes a trip so much more intimate and allows you to see a very different side of a country, thanks for sharing your experience! beautiful pictures! love you share all the good things Cuba has! What a wonderful trip, but what struck me most were your photography. Especially of people! You really captured their spirit. You have a gift! Now this is what I call covering a deserving side of cities and towns such as this! You’ve managed to get some really atmospheric pictures of the valley and the hills. I wonder when my next travel slot will be freed for Vinales. What a great adventure! Thanks for sharing all the photos so we could virtually participate in your trip. It is amazing that so many places in the world have their own aspects of beauty. Beautiful views! Your photos are so fantastic! I have never been in Cuba before. Someday, I would like to travel in the world. 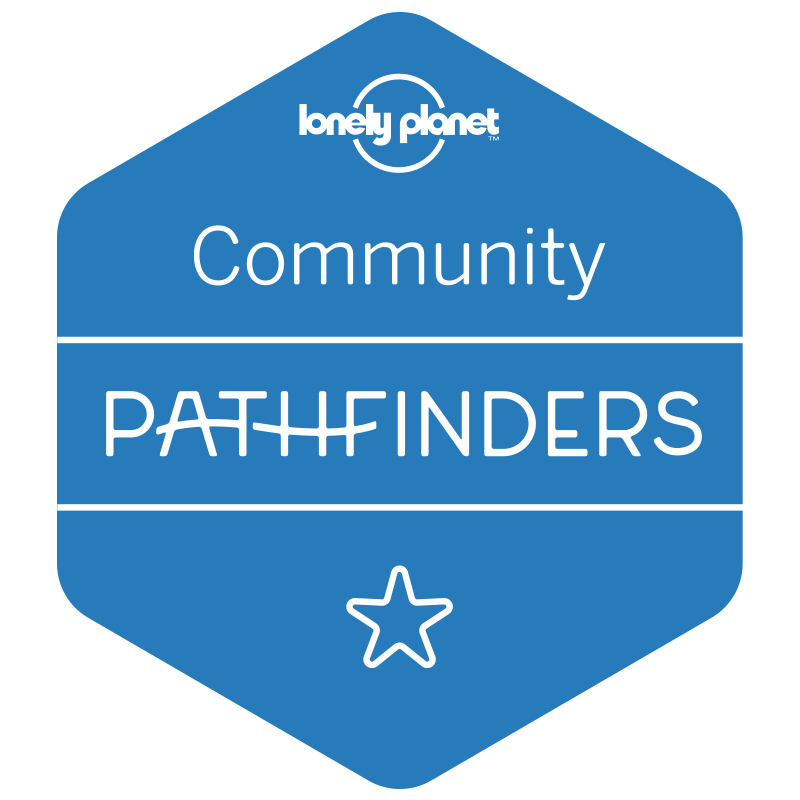 You took gorgeous photos of the locals, wildlife and green surroundings. One of the images that really caught my eye is the painted rock formations. Vinales looks amazingly beautiful. You really got some amazing shots. I love that the owners cooked for you and made you all feel special! Wow! You were so fortunate to experience the delicacies made by the locals. It would be an overwhelming experience on Christmas eve! It’s incredible to see that these people have such a big heart, their smile shows happiness even when their situations aren’t the best. You’re lucky to experience so many cultures. What a way to spend Christmas eve ! I enjoyed reading your post and the photos you have posted are so clear and bright. I have tried the lobster when I was in Dubai. It is indeed expensive and I had tried it at one of the most posh restaurants in Dubai so it they had rocket prices there. I love your writing style and I get lost in your stories. Amazing post and feedback! 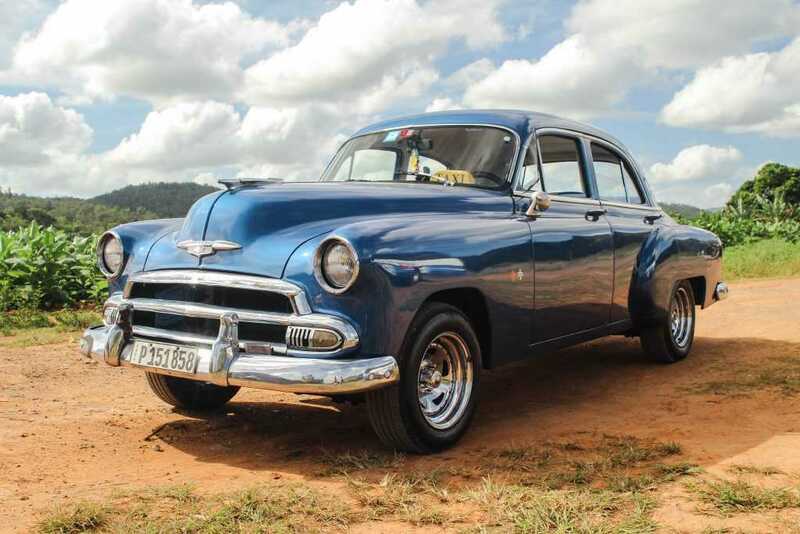 When I think Cuba I think cigars, vintage car and the music! The best way to know a culture and its people is to visit the inner villages and cities. You’ve taken some wonderful pictures. What an amazing Christmas you had! I loved the way how you have captured the portrait pictures through your photography! It looks so natural! I’d love to visit Cuba someday in my life! So amazing! My husband is Cuban, and we plan to visit Cuba sometime in the next few years.